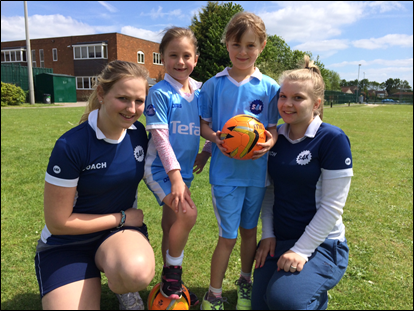 Girls’ Games – why football and rugby are not just sports for boys - Sport4Kids Football Coaching, Child Development & Girls Football Blog! Are girls restricted by other people's attitudes when it comes to choosing the sports they want to play? Discover why there's never been a better time for girls to choose football or rugby, and learn 11 ways to encourage your daughter to achieve her goals! It's been so exciting being involved in setting up new S4K classes in Twickenham and Hounslow, and ensuring that both boys and girls feel equally welcome. There are many different factors that affect children's choice of sport. I am especially keen that girls are given the opportunity to try out football and rugby, so they understand that girls can play these games just as well as the boys do. She's not scared – are you? My daughter came home from secondary school one day, excited to tell us she had been picked for the girl's rugby team! Admittedly she was already a good footballer, but the idea of her playing contact rugby was frightening. Visions of scrums and scary players immediately leapt to mind. However we were persuaded to let her play 'just this once,' bought her a gum-shield and of course she was perfectly fine. In fact we had to let her continue playing as her team kept on winning and made it all the way into the national finals. She was rightly proud and justified as we realised that our fear – not hers – was creating an unreasonable obstacle. Playing sport since she was tiny had given our daughter confidence in her body and her ability, as well as the determination and resilience that she needed to be fearless. 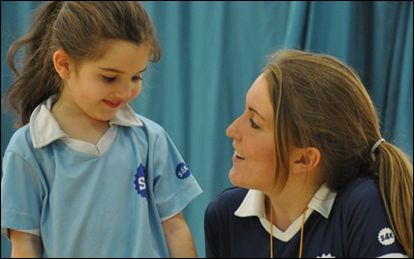 Sport4Kids classes are ideal for getting girls into sport at an early age and building their confidence. 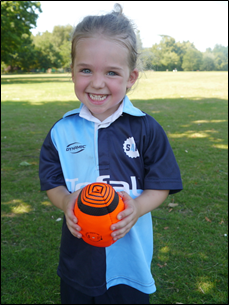 With the assurance of a safe environment and using the Montessori philosophy of the 'prepared child' to encourage independent learning, even Tots from the age of 18 months can benefit from S4K football and rugby skills-building activities, progressing into Kickers or Cubs classes at 3-5 years old. Girls have an equal right to play sport – any sport. Imagine your little girl tells you that she wants to have a go at playing rugby. Perhaps you have a nagging feeling that you should persuade her otherwise, that maybe it's not really a sport for girls, it's a bit too rough, it's not 'ladylike'? As a parent you believe you have a duty to protect her, but from what, exactly? Now imagine that your son asks to play. Would you feel differently? How would your daughter feel if her brother was allowed, even expected, to play and yet she wasn't given the same opportunity? In children's rugby classes S4K focus on skill with the ball in hand, based on the New Zealand All Blacks and Australian rugby league practice. This means the girls are not disadvantaged by their smaller frame. How old-fashioned and restrictive is the word 'ladylike'? I realised that it wasn't so much the physical nature of the game that I wanted to protect my daughter from, but people's attitude to the game, and by extension, the players. I was concerned that by participating in what are perceived as 'boys' sports she would be considered less feminine. This is the kind of thinking that can hold girls back not just in sport, but also in education, careers and all aspects of life. The perception of women's sport is rapidly changing and all girls should know they have an equal right to play whatever sports they like, without caring about other people's gender stereotyping. Sport England have been running a campaign which includes positive slogans such as 'hot and not bothered', and 'I jiggle therefore I am' alongside realistic images of women exercising and playing different sports. "Our research reveals a huge difference in the number of men and women playing sport. And it's not because females don't want to get active. Millions of women and girls are afraid to exercise because of fear of judgement… on appearance, ability or how they choose to spend time on themselves." 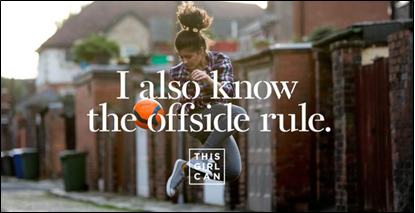 Sport England – This Girl Can campaign. Younger children are happy to play any kind of sport, yet as girls grow older, retaining their participation becomes a problem. Around the age of seven children begin to define themselves and what is important to them. This is when girls become aware of and often anxious about being judged differently on their appearance and behaviour. A 2015 Women In Sport survey (The Tipping Point: confidence and attitude in seven and eight year old girls) showed that Year 3 girls are more concerned with social acceptance than boys and it appears that this, along with boys' opinion that girls don't have the skills and abilities to play the type of games they enjoy, affects girls' innate confidence. This ingrained cultural belief that girls are not very good at some sports, rather than their gender, is a barrier. Only last week I sat on a bench watching a PE lesson with a 7-year old boy who declared, "Girls can't play football!" despite the fact they were obviously doing just as well as the boys, and enjoying themselves just as much. Maintaining a traditional approach to games may spoil your girl's enthusiasm for sport, and even make her doubt her own ability. All sports help girls to become physically and mentally fit, so they shouldn't have to conform to the unhealthy idea that some games aren't good for them, or worry that maybe they are not good enough for the game. Proper football or rugby coaching and training ensures that all children can play skilfully and safely at a level appropriate for their age. In May this year, despite being dismissed as "Las Princesas" and being told to go and play with their dolls by their opponents, Spanish football team AEM Lleida Junior Girls made headlines when they entered and won a boys' league. Their coach explained it was a matter of technical skill: "I told them that we couldn't compete with the boys when it comes to strength and speed because it's a physiological thing, and that we had to really focus on keeping possession of the ball." By playing to their own strengths rather than worrying about physical differences the girls demonstrated how they could succeed. The Spanish 'Tikki Taka' approach is incorporated in S4K's football coaching programme. Using a possession-based team philosophy anchored in technical short-passing skills, it is ideally suited to girls' lighter frames. "When I was younger I didn't realise there was a difference between men's and women's football. I was like, 'I'm going to play with them when I'm older"
Lucy Bronze, Man City and England player. In 2015 the Football Association raised the age limit at which boys and girls can play football in the same teams from 16 to 18 (in the UK), as 'an important additional choice to their female-only provision'. Even so, it's hard to find any mixed teams of older children on our local pitches: maybe there are some where you live? Especially since the 2012 London Olympics when female British athletes won ten gold medals, the way sportswomen are portrayed in the British media is improving. Stars such as Jessica Ennis-Hill (heptathlon), Helen Glover and Heather Stanning (rowing), Victoria Pendleton (cycling), Nicola Adams (boxing), and Jade Jones (taekwondo) became household names and inspired a generation of girls. Adams went on to retain her Olympic title at Rio 2016, where British women continued to win admiration and medals. The Women's Sport Trust is an organisation that aims to amplify and 'change the visual landscape' of women's sport. During Women's Sport Week last year they produced a set of guidelines for photographers and the media, encouraging them to focus on women's ability, not appearance. The Trust want there to be a diverse range of authentic and credible imagery available so the media can 'represent the athlete as she'd want to be seen'. If publishers have a duty to help make sport 'normal' for girls, surely parents have a duty too. As more strong sportswomen are recognised as role models by boys and girls alike, there may be a warmer welcome for girls in male-dominated sports such as football, rugby and cricket. In some cases women's teams have shown they can achieve better results than the men. 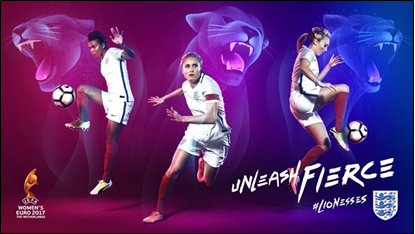 Since England's Red Roses won the 2014 women's Rugby World Cup, the Lionesses scored a place in the women's Football World Cup semi-finals in 2015 (and not forgetting the Women's Cricket team won the World Cup this summer), interest in the women's game has surged. This greater support leads to better options for girls who want to play. "As well as prompting serious interest from broadcasters, the media exposure of the 2015 World Cup contributed to a 48 per cent increase in FA Women's Super League attendances for that year. Growth slowed last season but crowds still rose five per cent." 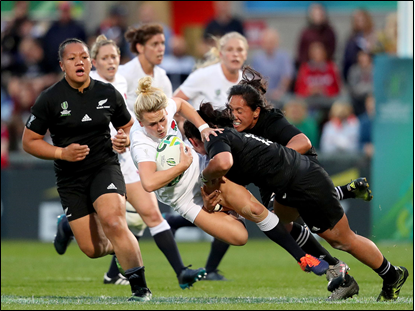 As fans' interest grows, so does investment in the game, for instance the RFU introduced a scheme to introduce rugby to 100,000 women and girls and the FA has plans to double the number of girls and women playing football by 2020. Women's sport is on the way up - there's never been a better time for girls who want to play! 1. Avoid discriminating between girls' games and boys' games. 2. Challenge your own perceptions of women's sport: watch some matches, find out about the players and the challenges they have had to overcome. 3. Being part of a team is a great way for girls to forge friendships and support each other, so help her to get to know the other players. 4. Remind her that feeling good and having fun are more important than looking good. 5. Tell her how cool her new kit is, not how good she looks in it. 6. 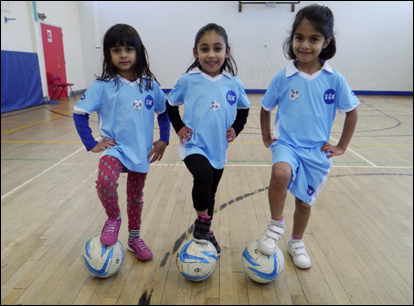 Bond over some books: children's author Tom Palmer's book, Secret FC, is about two girls who set up their own football club; Helena Pielichaty has written a popular series , Girls FC and don't forget Narinder Dhami's football classic Bend It Like Beckham. Jessica Ennis-Hill's autobiography Unbelievable is about following her dreams. 7. Be careful giving extra recognition if she's the only girl playing – she may find it embarrassing to be singled out, and others may think it's unfair. 8. Mud washes off. Try not to fuss or be over-protective if she takes a tumble. 9. It's normal to drop the ball, make a mistake, even lose matches, so let her know she needn't be afraid to fail. 10. Cheer her on! Give her plenty of praise from the sidelines. 11. You are the best role model, so set an example and join in too! Don't forget Sport4Kids are offering free taster sessions in football and rugby so girls - check out your local venue, come along and give it a try.